Canis lupus lycaon, commonly known as the eastern timber wolf, was the first gray wolf subspecies to be identified in North America in 1775. Fairly recent molecular studies have suggested it as being a distinct species of its own, the Canis lycaon. There has not, however, been any official change in classification. The eastern timber wolf was at one time found as far south as Florida and as far west as Minnesota. It still occupies over 40% of its original range in Canada. However, it is found mainly around the Great Lakes and St. Lawrence regions of southeast Ontario and southwest Quebec in remote, forested areas. Their greatest concentration is in Algonquin Park in Ontario. The eastern timber wolf does not always make use of shelters except when rearing offspring. Their shelters will always be near a water source. 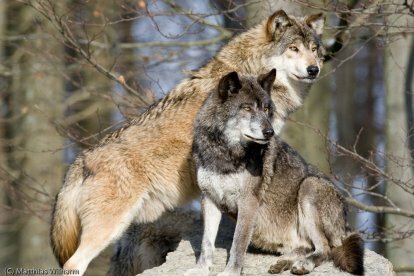 The territory of their pack may cover anywhere from 20 to 120 square miles. 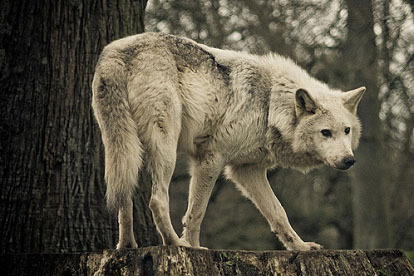 Eastern timber wolves come in a variety of colors from white to grey and from brown to black. They often have a reddish-brown muzzle and lower legs with white, grey, and black on their back. Smaller than the common gray wolf, they weigh anywhere from 50 to 100 lbs. The average adult male weighs 75 lbs. and the average adult female weighs 60 lbs. They measure 5 to 5 1/2 feet in length (tip of nose to end of tail) and 25 to 36 inches in height. 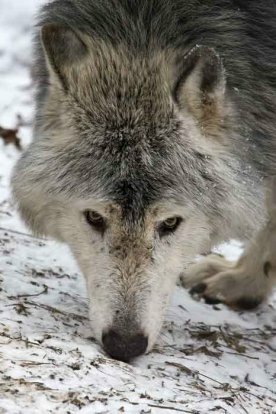 In the winter, the timber wolf feeds mainly on large animals such as white-tailed deer, moose, elk, and caribou. Other times of the year, its diet will include smaller animals such as rodents and fish. Eastern timber wolves breed in late winter. Like most other wolves, usually just the dominant male and female of the pack that breed. This helps keep up the strength of the pack. A liter of about five or six pups is born two months later in a den. They are deaf and blind, and weigh about a pound each. Growing several pounds a week, they start seeing at two weeks and hearing at three weeks. At six weeks, the pups are fed solid food regurgitated by the adults. By the end of the summer, the pups are close to full grown and blend in with the pack. As with other wildlife, human activity is the greatest threat to the eastern timber wolf. They came close to being extinct in the United States in the early 1900s. Today, they survive in only 3 percent of their original habitat in the United States. The only state where they are not listed as endangered is Minnesota where they are listed as threatened.